X-rays are forms of radiant energy, like light or radio waves. Unlike light, x-rays can penetrate the body, which produces images of internal structures. Laser + Holistic Dental offers our patients in house x-ray and CBCT scanning. Cone Beam Computed Tomography (CBCT) is a superior imaging technology compared to the traditional x-ray providing much greater levels of detail to produce 3D images of your teeth. soft tissues, nerve pathways and bones. CBCT also offers the additional advantage of lower radiation exposures relative to normal CT scans. We use X-rays and CBCT scans for diagnosis of many problems and often to assess your needs for oral surgery and any pre-existing conditions. While it is important to have up to date dental imaging, at we are also mindful of managing your radiation exposure. Since the discovery of X-rays and their utilization in diagnostic medicine, there has always been concern about the cellular damage the radiation can cause both for the patient and subsequent damage to the reproductive organs. Laser + Holistic Dental follows the ALARA princple or As Low As Reasonably Achievable, when assessing your radiography needs. In high doses radiation can have harmful health effects, and although dental radiology is relatively low dose – it is important to inform us if you are currently pregnant or trying for a baby. For pregnant women the most significant risk is during organogenesis (3 to 8 weeks in utero) where radiation exposure may increase the risks of childhood cancer and leukaemia.2 As a precaution for all patients, irrespective of gender or age, Laser + Holistic Dental provides a protective drape with a thyroid collar to cover the lower abdomen and also minimises abdominal exposure by collimating the x-ray equipment. We recommend that before having any x-rays or scans you discuss any family planning with our dentists so we can advise you on the best strategy for your needs. The thyroid gland is also highly susceptible to radiation carcinogenesis. 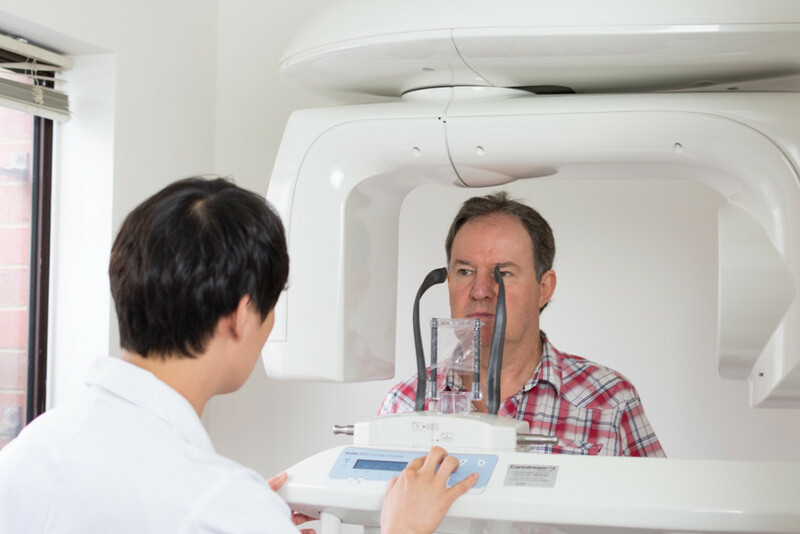 Dental radiography is often overlooked as a radiation hazard to the gland and may be associated with the risk of thyroid cancer. An increased risk of thyroid cancer has been reported in dentists, dental assistants, and radiographers.7 For your added protection, should dental X-rays be recommended in the course of treatment, Laser + Holistic Dental provides a protective shielding thyroid collar when dental X-rays are taken. 5. Radiation-induced clastogenic factors: anticlastogenic effect of Ginkgo biloba extract.